Turn a bit of your yard into an oriole feeding station with the Heath Clementine Fruit and Jelly Oriole Feeder. Orioles often prefer dining on fruit and jelly, rather than bird seed, and this unit perfectly meets their needs. Its fun, round shape and bright orange color mimic citrus fruit, and its unique design offers orioles two of their favorite foods at once. Two stakes extend from one side of the disc, each stake easily holding half of an orange. A glass bowl sits on the other side of the frame, which can be filled with 2 ounces of grape jelly or oriole nectar. This vessel may be removed for thorough cleaning or quick refilling, and an attached chain makes hanging the feeder simple. Its all metal body creates a durable station, and the bright orange, powder coated finish protects the piece from the elements. 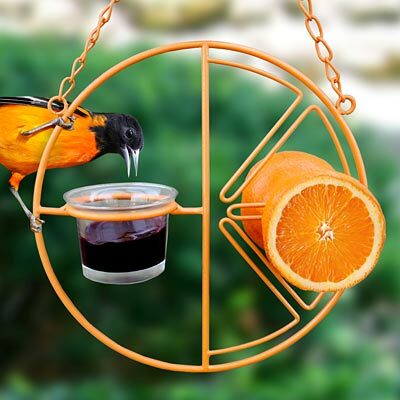 Provide orioles their favorite snacks at once in this Clementine Fruit and Jelly Oriole Feeder.